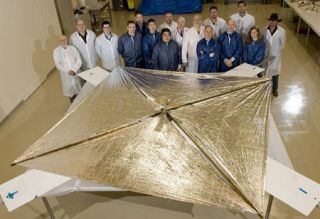 EdwardMontgomery's team and a team from Ames Research Center hope to deploy a solarsail called NanoSail-D this summer. A SpaceX Falcon 1 rocket will carry it into space from Omelek Island in the Pacific Ocean between July 29th to August 6th. "NanoSail-Dwill be the first fully deployed solar sail in space, and the first spacecraftto use solar pressure as a primary means of attitude control or orbitalmaneuvering," says Montgomery, who is NanoSail-D's payload manager. "We are always on the lookout for opportunities. Ames owns a slot on the Falcon 1 launch and asked us if we wanted to go along. We said,'Yes!' We'll use the Poly Picosatellite Orbital Deployer, or P-POD, developed bythe University of California Polytechnic Institute to deploy our sail." If successful, this will be the first deployment of a solarsail. An earlier effort mounted by the Planetary Society, CosmosI, failed three years ago. Science fiction fans have been looking forwardto this for generations. As Arthur C. Clarke's wrote in his 1964 short story Sunjammer. "Hold your hands out to the sun. What do you feel?Heat, of course. But there's pressure as well — though you've never noticed it,because it's so tiny. Over the area of your hands, it only comes to about amillionth of an ounce. But out in space, even a pressure as small as that canbe important — for it's acting all the time, hour after hour, day after day.Unlike rocket fuel, it's free and unlimited. If we want to, we can use it; wecan build sails to catch the radiation blowing from the sun." " ...there will some day appear velocities far greater than these, of which light orelectricity will probably be the mechanical agent ... "
This is particularly noteworthy since the existence of lightpressure was not even proven in theory until 1873 (by James Clerk Maxwell). The Russian theoretician Konstantin Tsiolkovsky worked onthe idea of solar sailing in the 1920's, but the first work to spark theinterest of scientists and sf writers came in 1951, with the publication of"Clipper Ships of Space." This Astounding Science Fictionarticle was not a story, but an exposition of the principles of solar sails. Cordwainer Smith wrote what was probably the first actualstory about solar sails in 1960. "The Lady Who Sailed The Soul"took place in the far future, when people ventured on decades-long voyages inships equipped with solar sails "tissue-metal wings with which the bodiesof people finally fluttered out among the stars." Soon thereafter, a 1962 short story by Jack Vanceappeared - a classic named "Sail 25." Thisis the story of a "sink-or-swim" training cruise in which six spacecadets find themselves under the unforgiving tutelage of Henry Belt, who statedthat it was his fate to one day die in space. Cordwainer Smith wrote another story in 1963 with moredescriptions of this technology: "immense sails - huge films assorted inspace on long, rigid, coldproof rigging." See this NanoSail-Ddeployment video; via NASA. Video Player: Danger: Solar Storm!